Under heavy protection in this dusty, dangerous capital, Laura Bush expressed support Wednesday for Afghan women freed from Taliban repression and urged more educational opportunities and greater rights. Afghanistan's leader said the first lady's visit mattered more than international aid. Mrs. Bush met with women who are training to be teachers and gave presents to Afghan children on the street. She visited President Hamid Karzai and thanked U.S. troops for bringing down rulers who kept girls from school. The first lady spent just six hours on the ground after flying nearly halfway around the world. U.S. troops manned M-60 rifles at both ends of the four helicopters that carried her and her entourage. "We are only a few years removed from the rule of the terrorists, when women were denied education and every basic human right," Mrs. Bush said at a teacher training institute. "That tyranny has been replaced by a young democracy, and the power of freedom is on display across Afghanistan. "We must be mindful though, that democracy is more than just elections," she said. "The survival of a free society ultimately depends on the participation of all its citizens, both men and women." 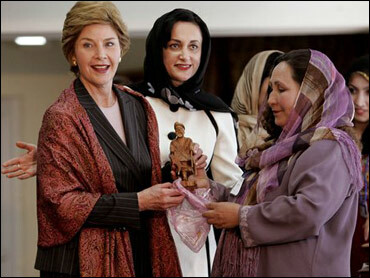 Mrs. Bush wore an afghan scarf around her shoulders and visited women making handicrafts for sale. Stopping at a bakery, she filled a box with cookies and paid one dollar. "Good deal," she said. She paused outside the shop to talk with three young children positioned to receive gifts of a kaleidoscope and a bookmark. "This matters much more than hundreds of millions of dollars," Karzai said of Mrs. Bush's visit, although the fragile democracy is heavily dependent on international aid. "Much more." Mrs. Bush ate with soldiers at Bagram Air Base and told them she had found great appreciation for their efforts. "Thanks to you, millions of little girls are going to school in this country," she said. Mrs. Bush is not the first first lady to venture into a potentially dangerous region. In 1969, Pat Nixon went to Vietnam to visit a hospital and talk with U.S. troops. And during World War II, Eleanor Roosevelt, a Red Cross representative, secretly flew across the Atlantic, shocking Irish farmers when she landed in their field. Mrs. Bush's trip, kept secret until the last minute for security reasons, was timed to coincide with a meeting in Kabul of the U.S.-Afghan Women's Council that aims to help Afghan women gain skills and education. Millions of women and girls have returned to work and school since the Taliban were ousted. Equality is embedded in a new constitution, and some women have abandoned the head-to-toe public veiling that was mandatory under the Islamist government. The women who met with Mrs. Bush at the university wore head scarves. One kept hers around her face so only her eyes peeked through. "I was a teacher. I taught elementary school," Mrs. Bush told them. "I know how important teaching is. I know how rewarding it is as well." Teacher Treena Abdul Momen told her, "Being illiterate is like being blind." President Bush said his wife called him before she left Kabul. The president said Afghans are showing people who live under oppression an example of the benefits of freedom. "Think about a society that has gone from a Taliban-dominated society — where if you were a woman who spoke your mind, you were taken to a public square and whipped — to a free society in which women are now being trained to be able to follow their hearts and teach," he said during a visit to Cedar Rapids, Iowa. "That's the difference between tyranny and freedom."